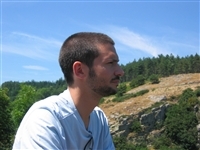 Mathieu Surin obtained a PhD from the University of Mons in 2005, in the field of self-assembly of conjugated polymers with Prof. Roberto Lazzaroni. In 2005, he was a visiting researcher at the University of California Santa Barbara with Prof. Alan Heeger. He then completed a post-doctoral fellowship in the group of Prof. Paolo Samorì at the Institute for Supramolecular Science and Engineering (ISIS) in Strasbourg. Since 2009 he is permanent researcher of the Fund for Scientific Research-FNRS within the University of Mons. His main research interests are supramolecular chemistry, bioinspired chemistry, and self-assembled materials. Teaching at UMONS: Supramolecular chemistry / Bioinspired Chemistry / Materials Chemistry / Molecular modeling. “Dynamic supramolecular polymer with stimuli responsive handedness for in situ probing of enzymatic ATP hydrolysis”, M. Kumar, P. Brocorens, C. Tonnelé, D. Beljonne, M. Surin, S.J. George, Nat. Commun. 2014, 5, 5793. “Binding modes of a core-extended metalloporphyrin to human telomeric DNA G-quadruplexes”, J. Rubio-Magnieto, F. Di Meo, M. Lo, C. Delcourt, S. Clément, P. Norman, S. Richeter, M. Linares, M. Surin, Org. Biomol. Chem. 2015, 13, 2453. “Self-assembly and hybridization mechanisms of DNA with cationic polythiophene”, J. Rubio-Magnieto, E.G. Azene, J. Knoops, S. Knippenberg, C. Delcourt, A. Thomas, S. Richeter, A. Mehdi, P. Dubois, R. Lazzaroni, D. Beljonne, S. Clément, M. Surin, Soft Matter 2015, 11, 6460. “From nucleobase to DNA templates for precision supramolecular assemblies and synthetic polymers”, M. Surin, Polym. Chem. 2016, 7, 4137. “Origin of DNA-induced circular dichroism in a minor-groove binder”, N. Holmgaard List, J. Knoops, J. Rubio-Magnieto, J. Idé, D. Beljonne, P. Norman, M. Surin, M. Linares, J. Am. Chem. Soc. 2017, 139, 14947. “Photomodulation of DNA-templated supramolecular assemblies”, J. Rubio-Magnieto, T.-A. Phan, M. Fossépré, V. Matot, J. Knoops, T. Jarrosson, P. Dumy, F. Serein-Spirau, C. Niebel, S. Ulrich, M. Surin, Chem. Eur. J. 2018, 24, 706.